SCVHistory.com | Aircraft Down | Nightclub Performer, 2 Others Killed in Plane Crash at (the Real) Magic Mountain, 1967. Crash of Light Plane at (the Real) Magic Mountain. Incident Tuesday, November 28, 1967. Rex J. Sylvester was a bandleader on the Los Angeles and Las Vegas nightclub circuits in the 1960s. Sometimes billed as Rex Sylvester and the Moonlighters (with or without his "Swinging Soprano Sax") or as The Rex Sylvester IV (presumably a quartet), he played the Melody Room on Sunset Strip, the Bel Air club in the San Fernando Valley, the Sahara Hotel in Las Vegas and elsewhere. Sylvester was born June 30, 1933, in Indiana; married (Joyce Wilde) Aug. 29, 1955 in Encino; and died Nov. 28, 1967, when his plane crashed into Magic Mountain, a mountain in the Angeles National Forest along the Santa Clara Divide southeast of Newhall. The Argus (Fremont, Calif.) | Friday, December 1, 1967. 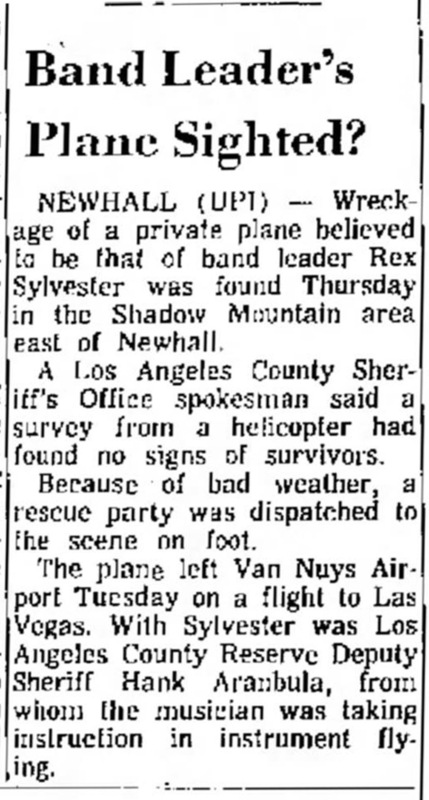 Newhall (UPI) — Wreckage of a private plane believed to be that of band leader Rex Sylvester was found Thursday in the Shadow Mountain area east of Newhall. A Los Angeles County Sheriff's Office spokesman said a survey from a helicopter had found no signs of survivors. Because of bad weather, a rescue party was dispatched to the scene on foot. The plane left Van Nuys Airport Tuesday on a flight to Las Vegas. With Sylvester was Los Angeles County Reserve Deputy Sheriff Hank Aranbula, from whom the musician was taking instruction in instrument flying. Plane Crash Kills Three from Valley. Van Nuys News | Sunday, December 3, 1967. Ground search crews, hampered by rough terrain and icy temperatures, finally managed to reach the wreckage of a light plane Friday after hours of grueling effort. Dead at the scene were Bandleader Rex Sylvester, 34, of 10525 Marlein Ave., Granada Hills; Henry Aranbula, 46, a reserve sheriff's deputy who lived at 124 N. Hagar St., San Fernando; and JoAnn Graziano, 25, of 14660 Delano St., Van Nuys. The plane, a Cessna 172, crashed Tuesday. An air search located the downed craft at the 4,500-foot level of Magic Mountain, 13 miles east of Newhall. Sylvester, according to sheriff's deputies, was a novice pilot and reportedly owned the plane. He and his band had been appearing at the Bel Air Bowl in San Fernando. The plane took off at 2:30 a.m. Tuesday from Van Nuys Airport. Authorities said the pilot did not file a flight plan, but was believed headed for Las Vegas. 2 Rescued at Fatal Plane Crash Site. Van Nuys News | Sunday, December 10, 1967. 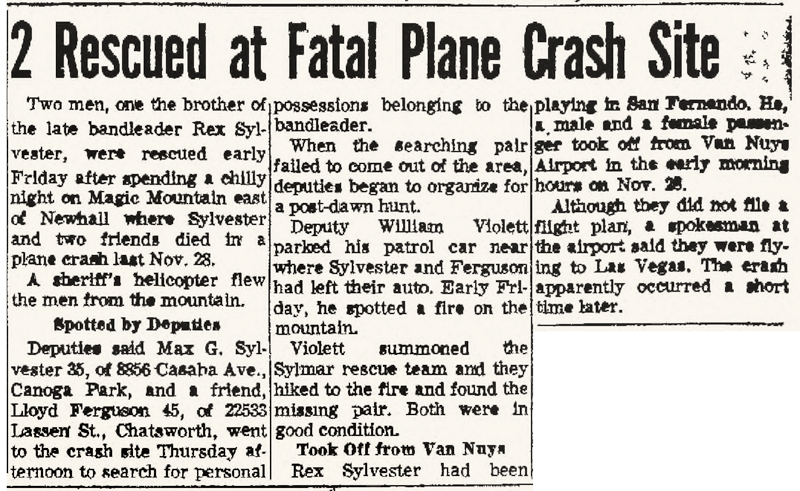 Two men, one the brother of the late bandleader Rex Sylvester, were rescued early Friday after spending a chilly night on Magic Mountain east of Newhall where Sylvester and two friends died in a plane crash last Nov. 28. A sheriff's helicopter flew the men from the mountain. Deputies said Max G. Sylvester, 35, of 8856 Casaba Ave., Canoga Park, and a friend, Lloyd Ferguson, 45, of 22533 Lassen St., Chatsworth, went to the crash site Thursday afternoon to search for personal possessions belonging to the bandleader. When the searching pair failed to come out of the area, deputies began to organize for a post-dawn hunt. Deputy William Violett parked his patrol car near where Sylvester and Ferguson had left their auto. Early Friday, he spotted a fire on the mountain. Violett summoned the Sylmar rescue team and they hiked to the fire and found the missing pair. Both were in good condition. Rex Sylvester had been playing in San Fernando. He, a mail and a female passenger, took off from Van Nuys Airport in the early morning hours on Nov. 26. Although they did not file a flight plan, a spokesman at the airport said they were flying to Las Vegas. The crash apparently occurred a short time later.